Cook noodles. Drain and lay flat. Thaw spinach and broccoli. Squeeze completely dry. Drain mushrooms. Empty Ricotta cheese into deep bowl, add three egg yolks, a handful of Parmesan cheese, a dash of nutmeg and parsley. Mix with spoon. Add mozzarella, spinach, broccoli and mushrooms. Mix well. 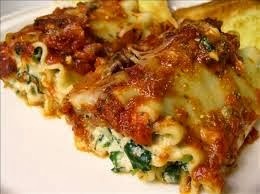 Spread some sauce onto bottom of lasagna pan. Use rubber spatula to spread Ricotta mixture onto length of lasagna noodles and roll tightly. Put roll ups into lasagna pan, seam down. Fit roll ups snuggly. Add sauce to top of roll ups. Bake at 350 degrees uncovered for about 40 minutes.